PUPILS, staff and the PTFA of Bishop Road School came together for a celebratory planting session in October, following a successful fundraising campaign to provide an outdoor learning environment for the popular city school. 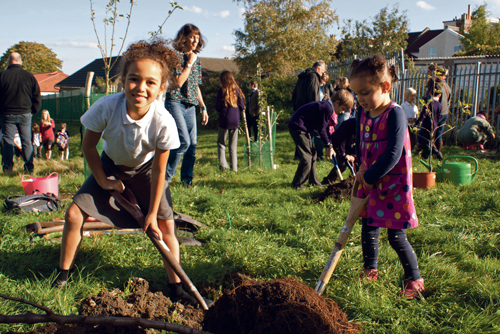 A number of fruit trees - apple, pear and cherry - were planted by the children with some guidance from the adults. It has been a project that has involved everybody from across the entire school, from reception to year 6. Teacher, Mr Kieboom, said: “We are getting the trees in now for the orchard area so that there is at least one tree for every year group. The children can harvest the pears and the apples and understand the lifecycle of the fruit. This is the final stage of fundraising £2,500 but the plan is to raise more money to plant more trees and provide extra activities for the after school club that use these fields. A planted native hedgerow is going in by the allotment fence, using Hawthorn and Hazel. Lucy Reeves said: “We will be able to talk to the children about hedgerow plants and why they are growing. We are going to interplant with some bulbs to make it a pretty place for classes. It’s a nice elevated view looking out over the grass. “We have been blessed with generous parents. We have raised beds and the after school, eco school club at the allotment. We are arranging for each class to come up here for at least two times so that they can plant something and harvest it later in the year."